It’s snowy and bitterly cold in Toronto, so if you have the option of just staying inside and keeping warm you may want to do that. The weather agency says that the snow will begin falling early this morning with a total accumulation of five to 10 centimetres near Lake Ontario and two to five centimetres north of Highway 7. The system is also being accompanied by frigid temperatures that could be among the coldest the city will feel throughout 2019. 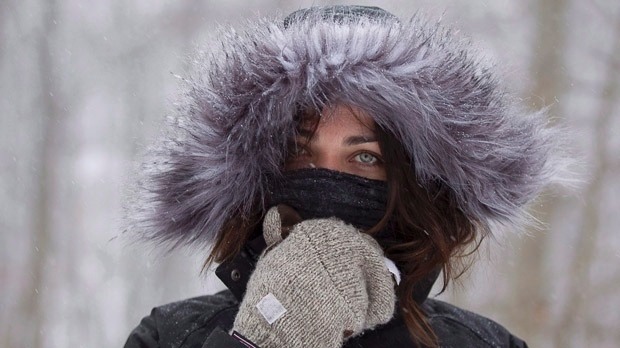 Environment Canada is forecasting a high of – 12 C for today but it will feel closer to – 23 with the wind chill. It won’t improve anytime soon either. A daytime high of – 15 C is in the forecast for Sunday and the weather agency says that it could feel as cold as – 35 with the wind chill overnight and into the early morning hours. Coulter said that the snowfall in Toronto will be fairly consistent throughout the day, topping out at about half a centimetre per hour this afternoon. He said that while the total accumulation won’t be significant, blowing snow will be a concern into the overnight hours. “The snow we are getting is going to be really light and even after it ends tomorrow morning we will have wind gusts of 50 km/h and that is going to create hazardous road conditions,” he said. Police say that they have not seen any notable spike in collisions so far today but they are nonetheless encouraging drivers to slow down. They also say that residents should consider whether their travel is “absolutely necessary” given the conditions. “Even with decent tires it is pretty slippery out there, so you have to give yourself extra time and consider that being home a few minutes late is better than winding up in a ditch,” Sgt. Jason Waters told CP24 on Saturday afternoon. By 5 p.m. Saturday, OPP Sgt. Kerry Schmidt said police had been called to more than 150 collisions on GTA-area highways. Inside the City of Toronto, police spokesperson Katrina Arrogante said police received 90 calls for collisions between noon and 5 p.m., with 26 of them resulting in injuries. "A few (people) have been transported to hospital but I don't have anyone in life-threatening condition right now," Arrogante said. Police want motorists to completely clear the snow from all areas of their vehicle before getting moving and to keep a safety kit in their cars. City officials have said that they will have 200 salt trucks, 300 sidewalk plows and 600 road plows at the ready to respond to today’s storm. They also say that they will be deploying 10,000 to 12,000 tonnes of salt on city roads as a “first line of defence.” That salt will also be mixed with a beet juice additive that is used to improve its effectiveness in extreme cold. Mills said that there about 1,500 staff available to respond to today’s storm. He said that plowing will begin on expressways once the total accumulation of snow reaches 2.5 centimetres, on main arterial roads once five centimetres of snow has landed and on local roads after eight centimetres. Bill Bishop Airport warned passengers to check their flight's status as snowfall and temperatures may impact flights on Saturday.